On August 13, 1961, following an extended run of East Germans fleeing through West Berlin to the west, the East German government strung barbed wire along the entire run of the “border” between the Western and Soviet sectors of Berlin and around the border between West Berlin and the GDR, and began construction of a wall that became burned in the minds of my generation as an image of the Cold War. 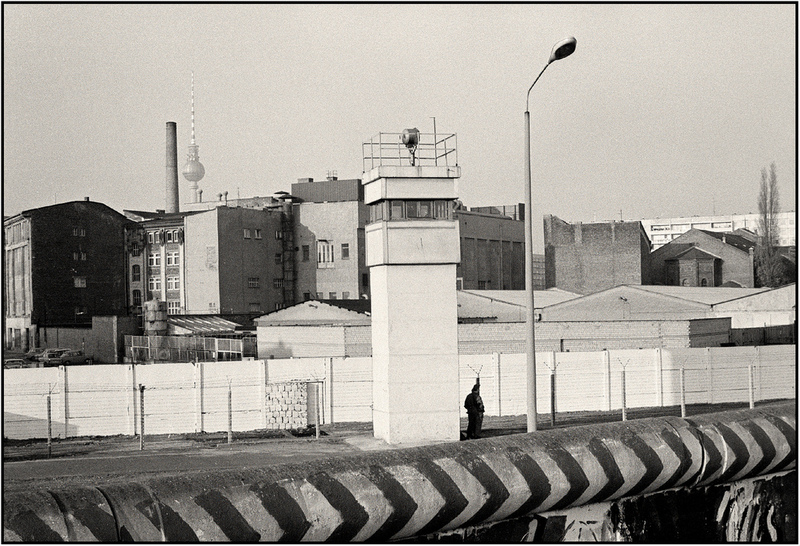 When we thought of the Iron Curtain and the threats of nuclear annihilation symbolized by that phrase, we as often as not had pictures of the Berlin Wall in our minds. The Wall stood for 28 years, until the Revolution Year of 1989, when loosening of the grip on their satellite countries began the crumbling of the Eastern Bloc, beginning with Germany. When the East German government opened the borders to free passage in November, men and women literally danced on top of the Wall, while the GDR army guards looked on in silence — or, perhaps in some cases, sheer astonishment. I remember people up there that night with a magnum of champagne in one hand and a sledge hammer in the other, taking (mostly ineffectual) swings at the reinforced concrete, layered with years of graffiti on the western side, between swigs at their bottles. People got a little more determined over the next few days, especially with official sanction from both sides, and the Wall for the most part came down for good and all. Only a few long sections remain today, while panels of the remainder occupy places in museums and private exhibits around the world, and rubble is peddled as souvenirs to tourists. A fragment also exists in Second Life, on the southern edge of part of the modern Berlin regions, appropriately named DDR (for Deutsche Demokratische Republik, “German Democratic Republic”). The border between the two sims is just that — an actual border. The sim itself is locked to entrance; I even clicked on a sign that gave me a “DDR visa,” but kept bouncing at the checkpoint. So I shot a few pictures on the “free side” of the Wall, to add to what I photographed in front of the Grid build of the Gate.